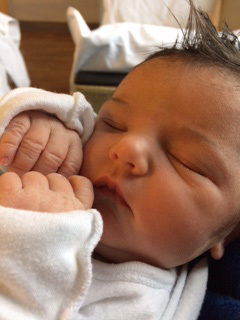 Tag Archive | "Andrew Martin"
Katie Anderson and Andrew Martin of Cedar Springs are pleased to announce the birth of their daughter, Adelynn Rose Martin. She was born on February 11, 2017 at 11:12 at Spectrum Health Butterworth Campus. She weighed 5 pounds 15 ounces and was 19 inches long. Adelynn was welcomed home by her sisters, Riley Martin and Kayla Schoenborn. Proud grandparents are Mark Anderson and Linda Morse of Cedar Springs, Catherine & Jeff Knapp of Cedar Springs and Chuck Martin of Rockford; and maternal great-grandparents, Baa – Boo Anderson of Cedar Springs.